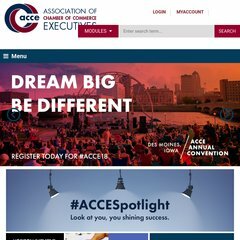 Topics: Ask Acce, What's New, Acce Central, Upcoming Events, Blogs, and Chamber Spotlight. Age: It went live on March 4th 1995, making it over 23 years, 1 months old. 190 users visit the site each day, each viewing 2.60 pages. It is hosted by Ntt America Inc (Colorado, Centennial,) using Apache web server. Its IP Number is 198.171.144.136. ns1-hosts.srsplus.com, and ns2-hosts.srsplus.com are its DNS Nameservers. PING www. (198.171.144.136) 56(84) bytes of data. The server is slower than 81% of measured websites, at 787 milliseconds. Also a time of 46.0 ms, is recorded in a ping test.